When you have located any of the differences between the Guide and Dub signals that are listed above, editing the audio signals could be tedious and maybe even not help. For example, if a section of a Guide (say, at a breath) is "non-pitched" and this information gets transferred to the Dub where there is pitch, this will sound wrong in the Output. Revoice Pro provides a mechanism for quickly inserting a protective “coating” over a region or section of the Dub audio that prevents that section from getting Time and/or Pitch modifications. Quite often, inserting such a Protected Area in the Dub signal to stop it being processed, frequently removes the processing artefacts quickly and makes the output acceptable. This section explains how to do this. In the image below, the dark yellow Playback Range (now blue in Revoice Pro 4) at the top of the screen is positioned so it extends through a breath (low level audio) seen in the Dub Track 2 ( dark waveform) that does not occur in the Guide Track 1, where a note is held instead. The problem here is that the pitch in the guide signal note cannot be sensibly transferred to the breath region, which has no pitch. The next image below shows the result once an APT process is inserted with APT settings selected to process Time and Pitch. The light trace in the Guide is the pitch, which can be seen as continuous and the Dub pitch trace does not continue across the gap where the breath is located. 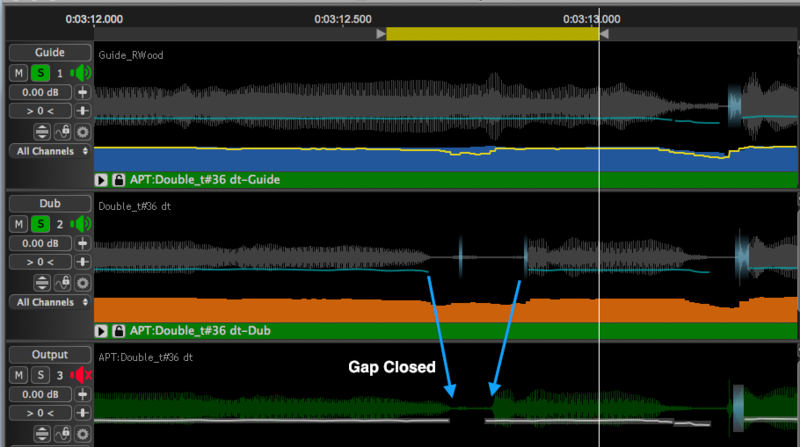 The short blocks in the gap in the Dub indicate non-pitched sounds. 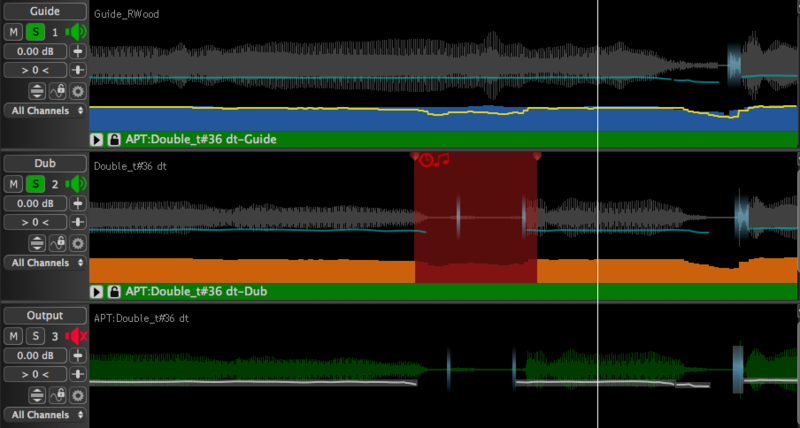 In the Output track, the Dub audio has been pulled back into the gap. This result may sound OK, or not, depending on the audio content. Make sure the APT Process is selected (in this example it is). RIGHT CLICK in the Dub track display at the position you want the protection to start (before the start of the gap in this example) and select from the Pop-up menu shown right Add Protected Area. Go to step 4 if you can select this option. If you do not see the option to Add Protected Area, and you see the menu as shown below left, then RIGHT CLICK the APT name ("APT:Double_t#36dt" in this example) and select Edit Energy and let the pop-up close. Then RIGHT CLICK again in the track and the pop-up menu should appear as shown above right with Add Protected Area option. Select Add Protected Region and in the follow-on pop-out menu shown below, select whether to protect the Dub Pitch, Time or both from being changed. We have chosen Protect Pitch and Time for this example. A short, transparent red Protected Area will be inserted in the Dub track (as shown below) which can be extended or narrowed by putting the mouse at either side of the range block, LEFT CLICKing and dragging either the edges, or if the hand cursor is shown, click in the range and dragging the whole Protected Area to the required position as shown below. The Protected Area will contain one or two possible icons: clock (time) or musical notes (pitch) depending on the protection mode selected. When the audio is processed with the Protected Area, the Time or Pitch features selected for protection will not be processed in that Dub audio Area. As shown in the Output Track in the picture above at the bottom, the protected range in the Dub track appears unprocessed in the Output track. If you set up a loop with the Playback Range and Loop control, the edges and position of the Protected Area can be manipulated while listening for the best-sounding join at each end of the region. This is done by manipulating the Protected Area and then Rendering the Output (processing) each time a change is made to hear when the result sounds most acceptable. Protected Area's settings can be changed or the entire Area can be deleted anytime. To do this, RIGHT CLICK on the Protected Area and the menu similar to the one right will appear. Simply chose either Modify Protected Area and reselect the feature to be protected or select Delete Protected Area.